Ability Housing recently released findings from The Solution That Saves, one of three state pilots to provide Florida-specific data concerning the effectiveness of providing Permanent Supportive Housing (PSH) for high utilizers of crisis services, such as emergency rooms, jails and overnight shelters. The Solution That Saves evaluated 68 participants in Duval County for four years (two years prior to receiving PSH, and during the first two years of housing). 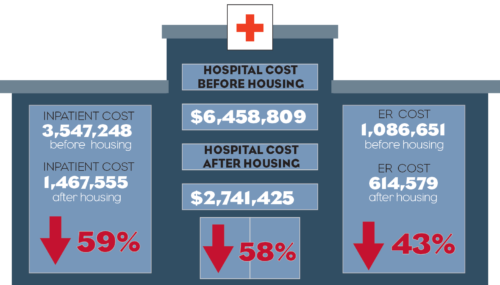 Results demonstrated a meaningful connection between housing and health care through decreased costs related to emergency services, as well as noteworthy mental wellness and quality of life improvements. After two years in housing, participants showed a 30.9 percent decrease in suicidality, a 20 percent decrease in agoraphobia and a 19.9 percent decrease in drug abuse or dependence. Quality of life measures showed an overall perceived improvement of 15.1 percent, including a 25.8 percent increase in perceived health and a 20.7 percent increase in perceived psychological/spiritual quality of life. The Solution That Saves is part of a state initiative developed by the Florida Housing Finance Corporation. Florida Housing competitively selected three sites to develop and operate Permanent Supportive Housing properties to serve each community’s persons with greatest need. The pilot sites are located in Duval, Miami-Dade and Pinellas Counties. The Duval County pilot participants ranged in age from 20 to 64 years at the time they entered the project. All but two participants had at least one intellectual, physical or psychiatric disability. Disabilities are often the cause or a contributing factor to homelessness, and without proper care, can perpetuate homelessness. The project comprised 92 units of permanent supportive housing, targeted to low-income persons that were homeless or unstably housed and identified as high utilizers of crisis services. The housing was a combination of 49 units scattered throughout the community and 43 units at Village on Wiley, a multifamily development owned by Ability Housing and financed by the Florida Housing Finance Corporation that opened in Jacksonville’s Westside in 2015. The findings were evaluated by Health-Tech Consultants, Inc., and approved by the Institutional Review Board (IRB) through Jacksonville University. The Florida Housing Finance Corporation, Disability Rights Florida, the Florida Blue Foundation and the U.S. Department of Housing and Urban Development provided funding for the study.